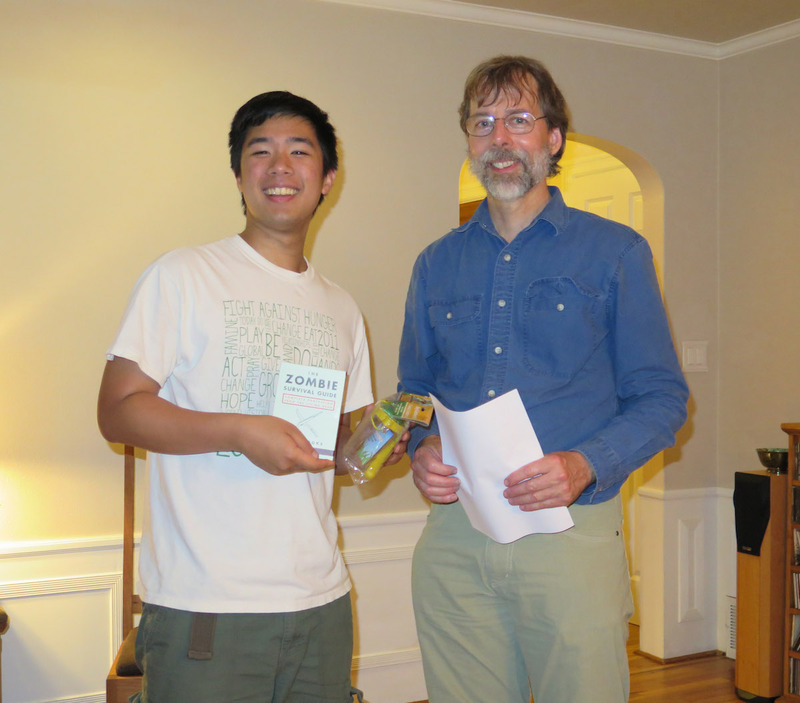 Discovering Insect Species: the Trepaneleven Awards! In the Discovering Insect Species course, the eleven of us (students Alex, Ana, Danielle, Elle, Julia, Mamo, Shannon, Tom, and Trevin, plus John and me) formed a great team, and we learned a lot together. 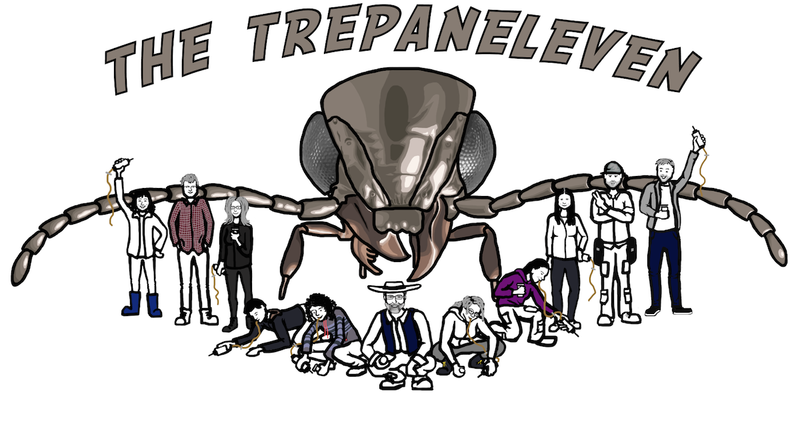 Over the course of the term, we became… the Trepaneleven! Design by Julia Amerongen Maddison. As with any group of superheroes, talents vary from hero to hero. In order to recognize the amazing abilities and achievements of the Trepaneleven, we held an award ceremony, at which awards were awarded. 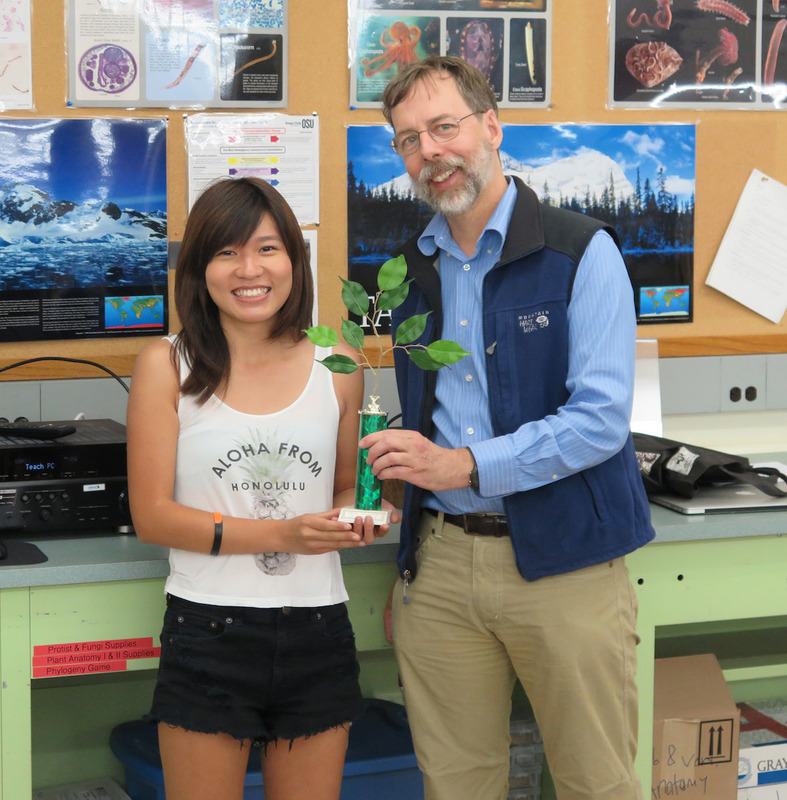 Julia excelled at finding the best species delimitation using a pre-release version of the Mesquite package Leaves (which attempts to delimit species using gene trees). Her award was a Leaves Champion trophy. 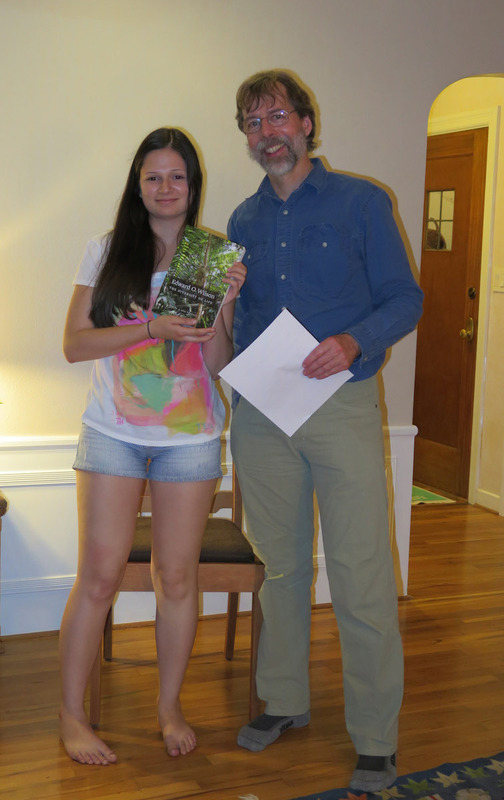 Elle’s interest in insect taxonomy and illustration made her the obvious choice for this award. 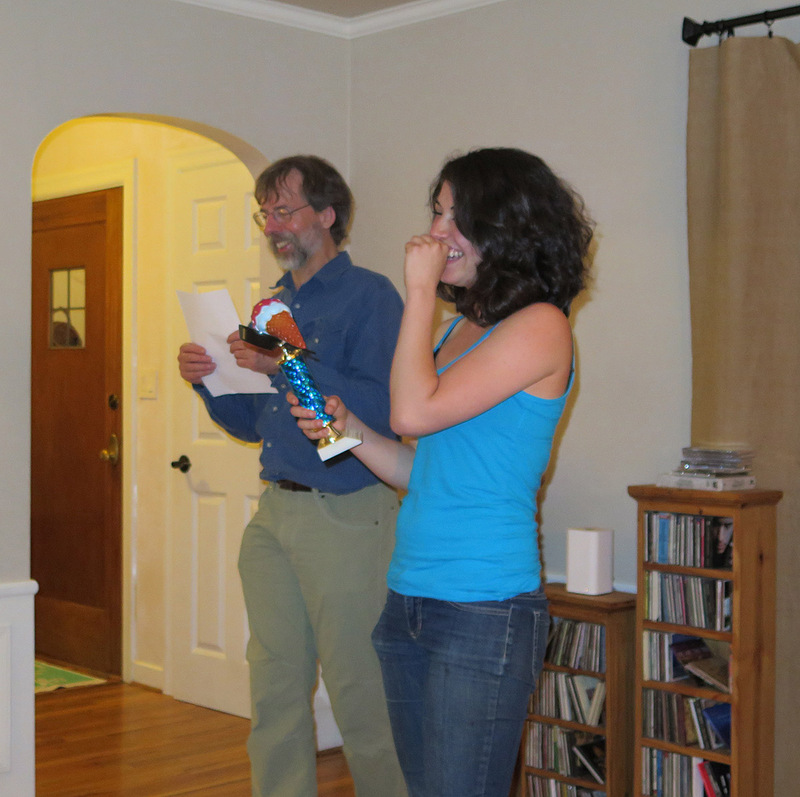 Her award consisted of a magnifying glass (with built in vial! ), some watercolor paper, and some Pigma pens. Danielle taught us the wonders of sautéing without oil during our Malheur field trip (as, well, the oil was inadvertently left in Corvallis). She was also excellent at leading us to ice cream, which the judges very much appreciated. 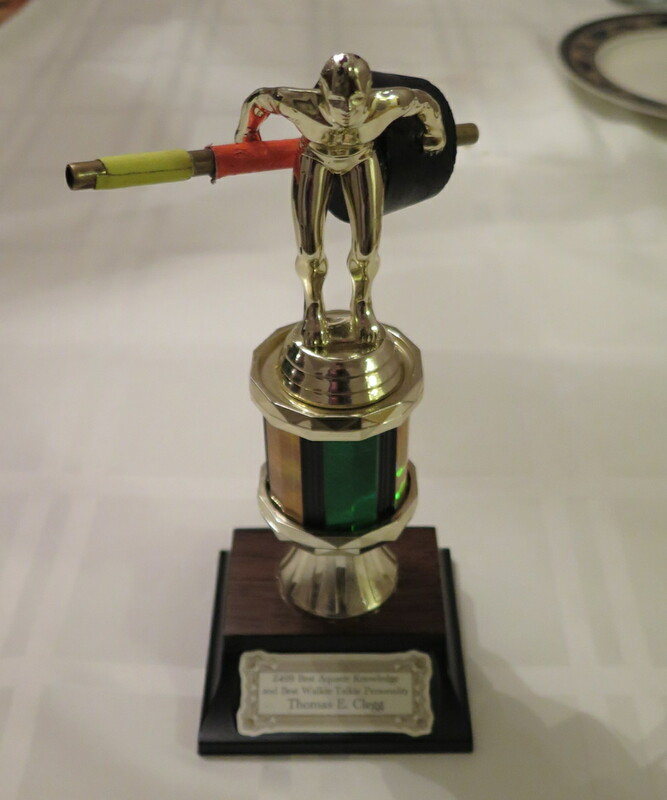 Her award was a trophy topped with crossing items: a skillet and an ice cream cone. As someone who has described new species in her native Brazil, the country that probably contains more undescribed species than any other, Ana was a natural for this award. 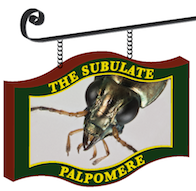 Her project (an interactive key to Bembidion (Trepanedoris)) also swayed the judges. Her award was a copy of E.O. Wilson’s book, The Diversity of Life. Let’s just say you had to be there, in multiple places at multiple times. With Alex’s interest in forensic entomology, a zombie survival guide and a bug collecting kit seemed the appropriate items to honor his achievement. Mamo discovered, at Malheur NWR, the habitat of the undescribed species that we first found at Klamath Marsh NWR. This allowed us to collect what will become the type series of the species. It was the most significant habitat discovery during the course, and for this the judges will always be thankful. As important, though, was Mamo’s evangelism for the wonders of Spam sushi, of which we became rather fond on our road trips. 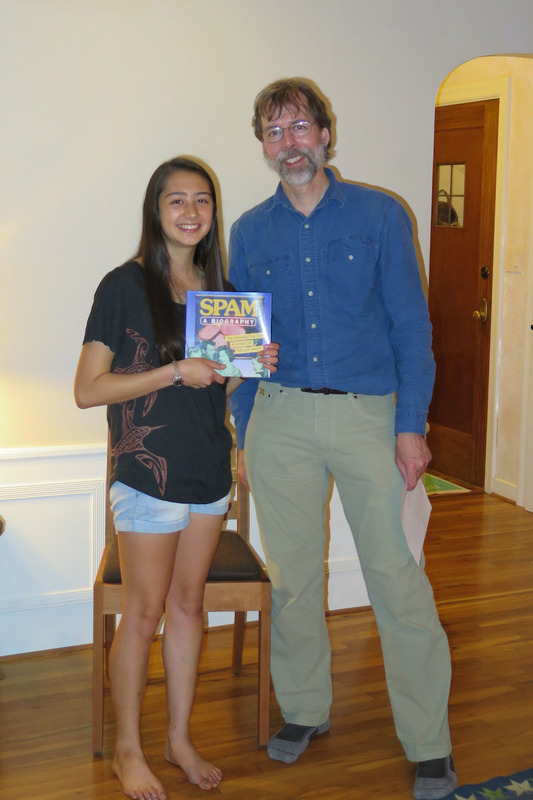 Her award consisted of a book on the history of Spam. Shannon not only discovered a new species in her parents’ backyard (it is still the only known locality), she was also overly adept at collecting little harpalines (thinking they might be Bembidion). She loves words and their histories, and so one way we honored her contributions was with a copy of Brown’s Composition of Scientific Words. 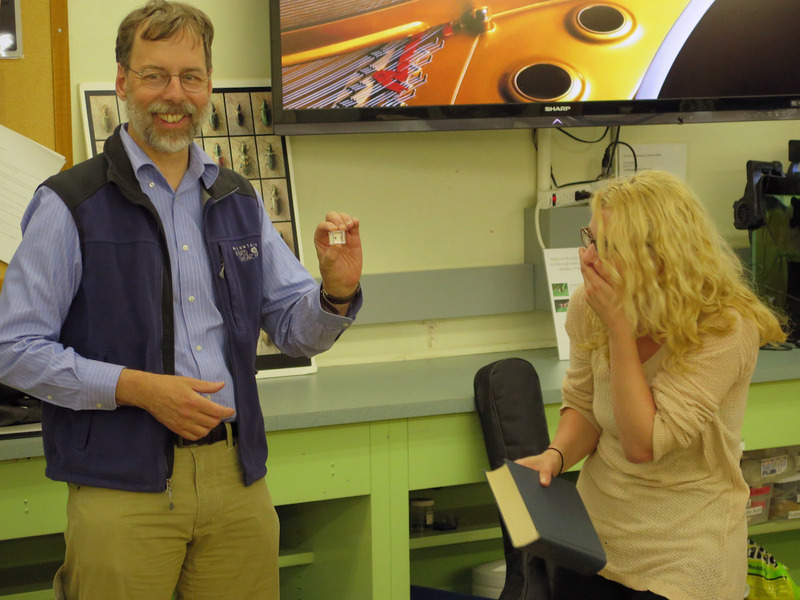 On the Malheur trip, her neck decoration one day, a tick, caused such a reaction that we immortalized that tick in a very small clear box, and presented that to her as well. 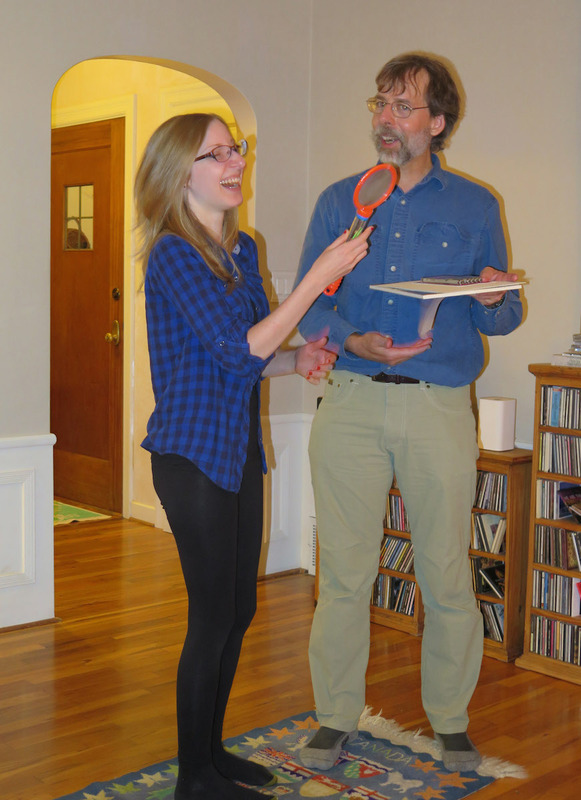 Tom knew everything about aquatic invertebrates (at least, that was part of the class myth). He also was excellent at manning a walkie-talkie so that we could communicate between vehicles as we drove our convoy to and from the field sites; his British accent and humor (or, rather, humour) were a real plus. 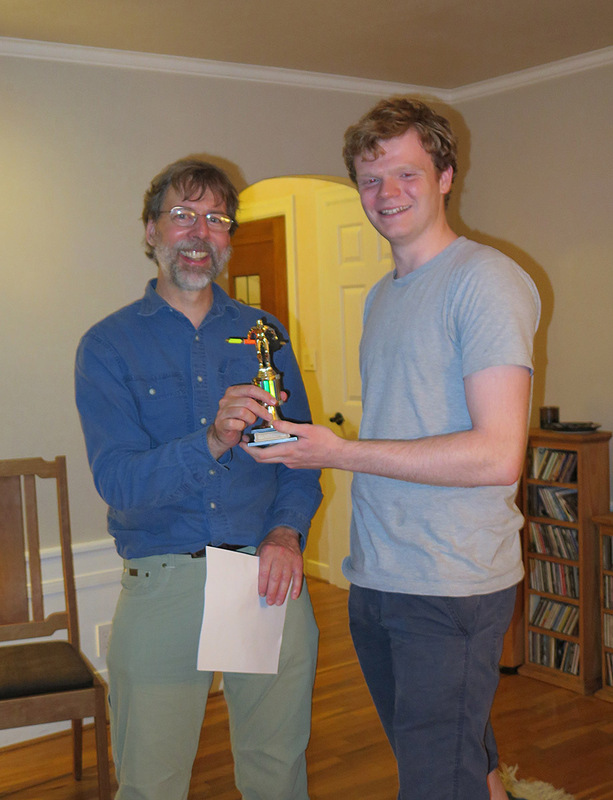 Tom was also adept at spreading parts of our aspirators around the countryside, and so his trophy was affixed with one such piece. Trevin did an excellent job of following instructions. 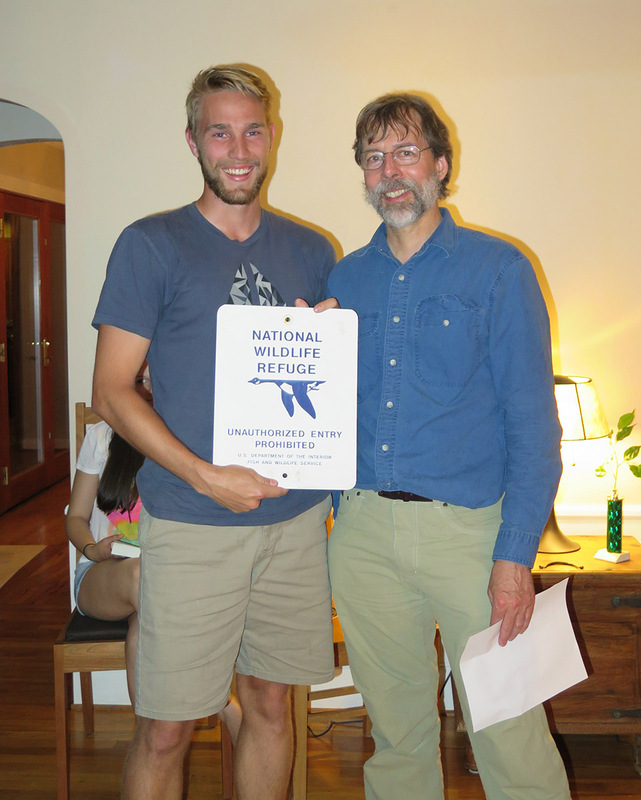 He also coveted a National Wildlife Refuge sign (containing instructions) that we were given by one of the wildlife refuge managers. In hopes that Trevin would continue to follow instructions, the judges were pleased to give him this award. This entry was posted in Z499 (Discovering Insect Species). Bookmark the permalink.